You will have probably gathered from the preceding pages that I quite like this piece of software. And you'd be right! 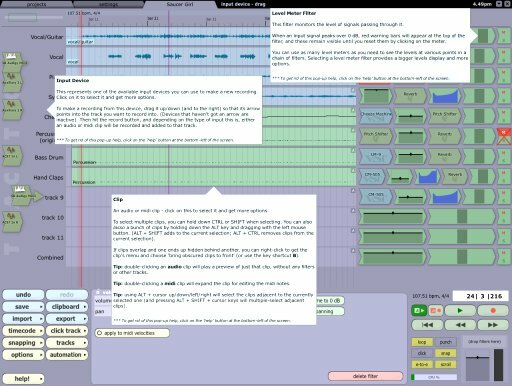 It provides the musician with a tool that helps him or her to produce music with the minimum of fuss which means forgetting about contending with driving the software and just getting on with making the music itself. For the new user there is a very shallow learning curve, everything is presented on screen in a logical manner, and initially they can opt to turn on the pop-up help - practically every aspect of the interface has some help and the (composite) picture below shows detailed help pop-ups for three items. So is Tracktion perfect? And the total answer to all musicians' requirements? No, of course not! But no software application can please everyone all the time. There are some users that totally hate Tracktion's unusual interface, preferring to stick with conventional applications with which they have become accustomed. However, there is a growing band of users who are coming to see that Tracktion has the potential to become one of the larger players in the marketplace and are coming along for what is turning out to be a seriously exciting ride. Tracktion is also constantly evolving. In 2004 Jules released new versions of both the PC and Mac OS X versions with Rack Filters (pictured right) up and running. He regularly visits the forum at K-v-R and seems to follow the 'release early and often' school of programming as advocated by Eric Raymond, which means that serious problems reported on K-v-R are fixed quite rapidly (sometimes only hours later) - you don't have to wait months for a patch release like some other software houses. Anyone serious about making music should at least download the freely available demo from the Mackie web site. Unlike many demo versions this one is fully functional - the only restriction is that, every few seconds, it outputs a few seconds of white noise which, while not unduly annoying, means that it cannot be used to produce a professional finish. However, at only £50/$80 for the full version I can't imagine many people sticking with the demo for long!